“Extremis” was the most unique episode of Doctor Who we’ve seen so far in season 10—but only because, unlike the rest of the season, it felt like an episode we’ve seen many times before from head writer Steven Moffat. For better or worse, it was a reminder of the style that will be forever linked with his time running the show. “Extremis” itself didn’t actually do all that much on its own. It finally revealed that Missy is the person inside the vault, and it set up an impending alien invasion of Earth by some decaying, red-robed monks we’ll be seeing play out over the next few episodes. And yet, even by doing little on its own, the way it was all set up was so different to anything we’ve had on the show so far this season, but like so many episodes that preceded it. Doctor Who has gone decidedly back to basics in season 10: a companion without a series-long mystery to her, making her less of a character and more of a puzzle for the Doctor to solve. Stories that are simple, clear takes on tropes the show has loved to explore for years. An overarching, distracting subplot that doesn’t overwhelm every story that’s being told. Buit “Extremis” throws all of that out the window to cram in as much of the multi-timeline, twisty-turny style that has dominated much of Steven Moffat’s writing for the show over the past few seasons... and honestly, that’s kind of a shame, considering just how refreshing this season had been so far without it. “Extremis” was bogged down by trying to do too much at once. The flashbacks to Missy’s faux-execution and imprisonment in the vault awkwardly sit in the story with little reason beyond the revelation in the finale that the Doctor is recalling all this back to her through the door of the vault. The set-up of the Vatican holding a killer sacred text in its deepest, darkest collections ultimately goes nowhere until it’s needed for the twist to tell you that everything that happened 45 minutes (and one bad attempted reference to Super Mario Bros) later didn’t actually matter, because it was all a simulated set up for the actual invasion you’ll get to see next time. It traded simplicity for a needless level of complexity, and failed to do anything interesting with it. The episode is far too bogged down with build-up and revelling in its own abundance of ideas, barrelling about from scene to scene, that by the time it’s over and you’ve thought about it, it all comes across as a bit hollow for the sake of a twist/reveal, which Moffat has used time and time again in the series, to ever-diminishing results. Frankly, it’s the sort of storytelling I won’t miss when Moffat has departed the show, and its return in the middle of a season that’s had been so good without it made it all the more frustrating. And yet despite my grievances, “Extremis” is also filled with reminders of what Moffat has excelled at in his time as showrunner, individual moments that shine, even if the wider picture they’re placed into doesn’t. The flashbacks between Missy and the Doctor might not do much for the episode at large, but they’re sublimely written—it’s clear that one of Moffat’s favorite partnerships on Doctor Who is the Doctor and the Master, the ultimate will-they-won’t-they relationship, each trying to figure the other’s plans and motivations out. It’s why Missy has become one of the best recurring features of his past few seasons. It’s also, despite some pretty dark moments, extremely funny; only Moffat could get away with using the off-screen suicide of a character for a black comedy punchline in a family show. Bill’s disastrous first date with Penny is a classic intrusion by the Doctor on his companion’s personal life, and the best kind of absurdity. 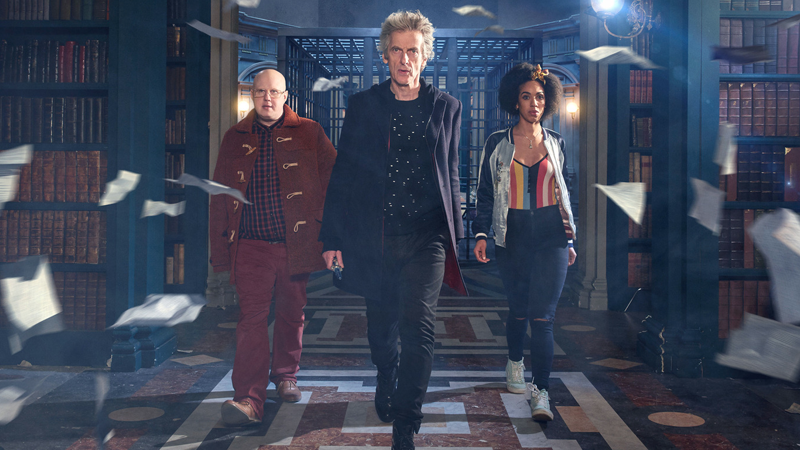 And, when separated from the Doctor, Bill and Nardole make for a wonderfully humorous duo that plays to the strengths of both Pearl Mackie and Matt Lucas, a combination of gung-ho adventurer and slightly cowardly tagalong that makes for some great laughs. “Extremis” feels out of place in Doctor Who’s tenth season: one last indulgent huzzah for tropes and ideas that have come to define Steven Moffat’s time on the show, both good and bad, resulting in an episode that turns out to be a mere prelude to something else. We’ll have to wait and see over the next few episodes if this set-up was worth, but for now, like the alien monk’s plan to invade Earth, it feels like a bit too much smoke and mirrors. I’m very much glad that the Doctor’s blindness-curing Gallifreyan doohickey was only a temporary reprieve to his ailment rather than something permanent (although I guess very little of this simulation-set episode is permanent anyway). This episode mostly danced around the Doctor’s blindness, but as this storyline with the Monks ramps up it’ll be interesting to see how it plays in. River’s diary returns as Nardole’s seal of approval in the Doctor/Missy flashbacks... but why did River care so much about Nardole? There’s clearly more to Nardole going on this season than we’ve seen so far, but hopefully we actually learn some of that soon. He’s been a great source of humor so far, at least. The Doctor’s clothes during the flashback with Missy match up to the clothes he’s wearing in scenes shown in an earlier trailer during his seeming regeneration... could we be seeing the end of the Twelfth Doctor coming about sooner than we think? They’ve been teasing a strange regeneration for Twelve for a while, and it cropping up this early in a season would definitely count as strange!